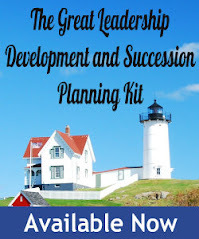 Last week Iasked readers to submit their burning leadership development questions. And boy, did they ever! Over 50 responses in just two days and more coming in every day! I’m going to do my best to get to as many as I can. Those that get picked for a post will receive a free copy of my eBook. “My organization is going through yet another re-organization. We are shifting people, projects and changing roles. We don't seem to have the big picture, therefore making it difficult as a leader in the department to support senior management. During the re-organization or transformation of the department, what are the top objectives for the key leaders? What should be our focus to ensure success? 1. Manage your own response to the change. Your employees will be watching you – what you say, how you say it, what you do, etc…. Do your best to set a positive example and be a role model for resiliency and dealing with the uncertainty. 2. Communicate. This is not a time to hunker down and wait until you have all of the “right” answers. Make yourself accessible, talk to people, listen, and do your best to gain clarity from your own leaders. 3. Involvement. Find ways to get people involved, in whatever way you can. Passengers don’t get carsick from the motion – it’s from the lack of control. Give them a sense of control. 1. Make time to get out and see people. When you are with them spend most of the time listening. 10.Be careful to not let sarcasm or cynicism creep into your language. 20. Pay extra attention to your star performers. They are often the first to get insecure. I especially like #11 and #15. Every team experiences change and while it helps for each piece of the puzzle to see where they fit in the big picture, the key is to continue to "manage our own response" and strengthen connections with the people we influence.